Incuse on the edge: NIHIL SINE DEO inscription "MIHAI I REGELE ROMANILOR" meaning "KING OF THE ROMANIANS", MIHAI I head facing left. Under the neck lies H. IONESCU, the engraver's name. The 250 lei coins struck under Michael differ in the inscriptions they have on the edge. 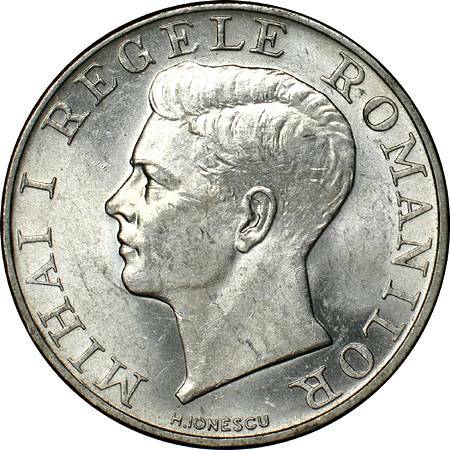 Both the ones featuring NIHIL SINE DEO (NOTHING WITHOUT GOD in Latin) and the ones with TOTUL PENTRU TARA (meaning ALL FOR THE HOMELAND) that entered circulation were struck in 1941. As a second distinction besides the edge engraving, inscription ~ 1941 ~ is guarded by two wavy lines on the NIHIL SINE DEO coin only and thusly unlike to the TOTUL PENTRU TARA variant (next page). Three rhomboidal adorned signs separate the words of the incuse inscription NIHIL SINE DEO on the edge. As it can be seen in the pictures above, the small axes of the rhombi are horizontal. 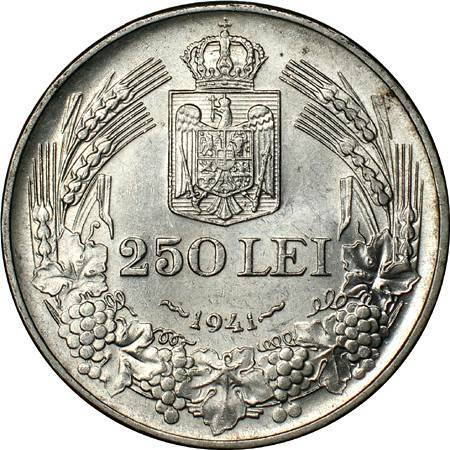 Coins with the face value of 250 lei were struck also under the king Carol II, in 1939 and 1940. These coins bear on the edge the inscriptions MUNCA CREDINTA REGE NATIUNE. Although the faces bearing the value of 250 lei seem to be identical to both kings, they are different. 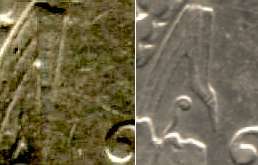 An obvious difference is shown in the picture below (the wheat leaf near the digit 2 in 250 is straight on the Carol II coins, at left or bent on the Michael 1941 coins, at right).